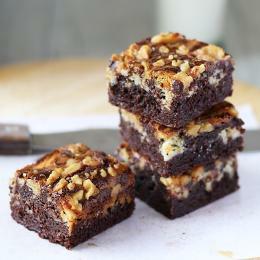 Fudgey, chewy, chocolately, gooey or nutty – you’ll simply love our brownies! Brownies Unlimited opened its first store back in 1989 selling four classic favorites including the Walnut Swirl, Rocky Road, and Choc O’ Chips. Our selection of brownies expanded over the years to now more than 11 decadent brownie varieties. In addition, we have extended our line of freshly-baked goodies to Brownie and Cookie Chips, Party Cupcakes, Sambos, Silvanas and more. One thing remained constant, we never compromised on quality. We bake all our products fresh every day using only the finest ingredients. Fast forward to 2018, we now have 58 company‐owned Brownies Unlimited stores, and we are still growing. Whether as a personal treat or a gift, our brownies always surprise and delight. Share some love today, share brownies from Brownies Unlimited. We want to serve you the best products using only all-natural ingredients and that’s our sweet promise!